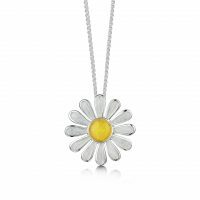 Daisies for Emily - Connard & Son Ltd.
Sterling Silver and enamel Daisies at Dawn pendant and necklet adjustable between 40 and 45cms. This bright and vibrant design is dedicated to Sheila's late husband. For every piece sold a donation is made to the Orkney Charitable Trust, which helps young people in Orkney experiencing ill-health or hardship. Matching earrings and bracelet also available. Sheila’s Notes – The Daisy was on my wedding dress and bouquet and I used my late husband, Rick's, “Daisies at Dawn” photograph to design the Daisies. 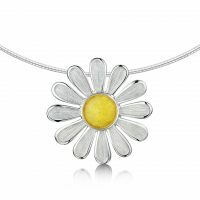 Sterling Silver and enamel Daisies at Dawn large pendant on wire necklet. This bright and vibrant design is dedicated to Sheila's late husband. For every piece sold a donation is made to the Orkney Charitable Trust, which helps young people in Orkney experiencing ill-health or hardship. Matching bracelet and earrings also available. 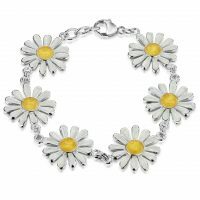 Sterling Silver and enamel Daisies at Dawn bracelet. This bright and vibrant design is dedicated to Sheila's late husband. 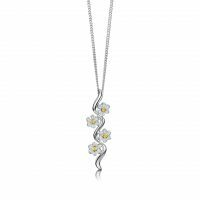 For every piece sold a donation is made to the Orkney Charitable Trust, which helps young people in Orkney experiencing ill-health or hardship. Matching pendant and earrings also available. 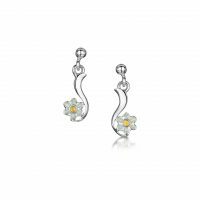 Sterling Silver and enamel Daisies at Dawn drop earrings.his bright and vibrant design is dedicated to Sheila's late husband. For every piece sold a donation is made to the Orkney Charitable Trust, which helps young people in Orkney experiencing ill-health or hardship . Matching pendant and bracelet also available. 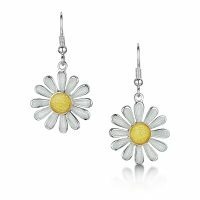 Sterling Silver and enamel Daisies at Dawn earrings. This bright and vibrant design is dedicated to Sheila's late husband. For every piece sold a donation is made to the Orkney Charitable Trust, which helps young people in Orkney experiencing ill-health or hardship. Matching pendant and bracelet also available.